Sometimes wanting to be “perfect” stops me from finishing projects. I’m now too tired to strive for perfection. I figure it’s time to experiment and remove expectation to get my “spark” back. I’m comfortable abstractly sloshing paint color around but “drawing” is another matter. Put a pencil or pen in my hand and I tighten both my grip and expectation. With that in mind, I purposely held the pencil very loosely and literally scribbled “areas” rather than try to draw perfect lines. I didn’t bother trying to copy anything, look at any references, decide where the light was coming from or have a plan. I just scribbled. I like the looseness of the drawing and taking away expectation of being precise was enjoyable. Maybe this is a good lesson to apply to other areas of my life . . . This entry was posted in Amusing Meditation, Creative Expressions, Fibromyalgia, Chronic Fatigue, MCS, Journal Pages, Life Altering Conditions, Mind-Body, Pain and Pleasure, Painting, puttering & drawing and tagged Carla Sonheim & Lynn Whipple, creative expression drawing, judy's journal, pencil and chalk drawing of a face, Year of the Spark. Bookmark the permalink. I may just have to post this above my desk. Thank you for the inspiration! I feel looser already. If you sell it I’d like royalties! Judy, whatever the process, the result is amazing. Thank you! I guess I’m still observing processes (even if it’s my own) even though I’m officially retired from analyzing! You can not only see through me you can see through my art – yup the headache is still there (in both my head and hers). Thanks for the compliment! I see a softer face in your drawing. Think your stress reduction showing now that you are retired? 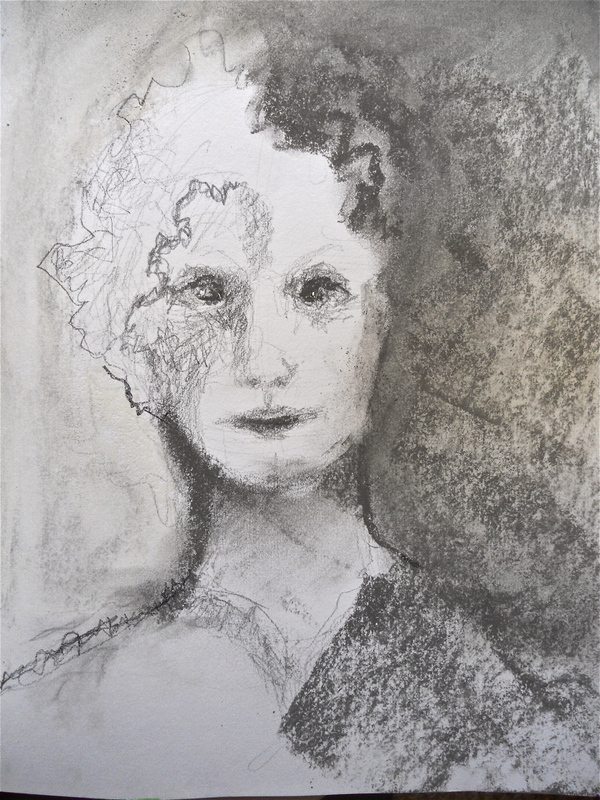 I would call this a gestural drawing – flowing and intuitive. When I taught art, I assigned several lessons to encourage kids to learn to draw this way, dumping their artificial expectations and moving toward authentic expression. Your drawing is lovely – please try more. I will try more – particularly now that I know what to call it! I bet you were/are a great art teacher based on the art you’ve created that I’ve seen. It’s rather like the writer/editor thing. We want to wear both hats at the same time and then we don’t get anything done. Do the think and then refine …. Easier said than done sometimes. This is actually very beautiful. One of my goals is to be looser as well. I started getting there with the drawing to music activity. Thanks Mama C. Isn’t it interesting how as adults we have to practice loosening up. The children you teach already know how. Guess it’s all about expectation, ultimately.